We are glad to include the following post by Dr Bobby Ghaheri, a healthcare professional from the US. This is his perspective on approaches to tongue tie, particularly the prevalence and treatment of posterior tongue ties. His views are not necessarily shared by LLLGB, you can find links to our resources on tongue tie at the bottom of this page. One of the most frequent things I hear is that primary care providers say something to the effect of “Oh, diagnosing tongue-tie is just a fad” or “This tongue-tie business is just something new that some people are doing”. My blog looks at the evidence in favor of releasing tongue-ties when those ties are the cause of breastfeeding problems. Ironically, there are no data that argue against treating tongue-tie for babies having breastfeeding problems. When people describe this focus on ankyloglossia and how it relates to breastfeeding as a fad, it doesn’t acknowledge the struggles of the mum or the baby. It minimises the frustrations felt by the dyad and does nothing to help solve the actual problem at hand. I am asking doctors and lactation consultants to approach this problem analytically rather than passing old dogma on to their patients. 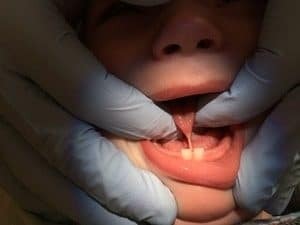 When medical providers and parents hear the phrase “tongue tie”, they most commonly picture a tight anterior tongue tie, where the tip of the tongue is tacked down to the floor of the mouth. I have previously described the difference between anterior and posterior tongue tie (PTT) but the concept still eludes many people. One of the most common statements I hear from medical professionals is that “posterior tongue tie doesn’t exist”. The most basic reason why people claim to not “believe” in PTT (as if it were a spiritual issue rather than an anatomical one) is that they know very little about breastfeeding and the relationship with tongue tie. Some of this sentiment comes from a blatant misunderstanding of the anatomy (they think the tie is in the posterior oral cavity near the tonsils). Others don’t understand the concept because they don’t know what normal infant tongues do during breastfeeding (as shown in ultrasound studies). Finally, most medical providers don’t understand proper examination technique, which prevents them from correlating the symptoms with abnormal anatomy. There are some published data on the presence of PTT. Cliff O’Callahan and colleagues, in a 2013 paper, treated 299 babies with tongue tie. Eighty four % of those babies had PTT; this number includes babies who previously had an anterior tie that was snipped by a different medical provider. Nevertheless, the majority of babies that presented to his office did not have an anterior tie. Dr. O’Callahan demonstrated clinically significant improvements in breastfeeding quality with a frenotomy. To those who don’t believe that PTT exists, I use this study to demonstrate that release of a tongue tie with no anterior frenulum results in clear clinical improvement. A more recent study from 2015 by Pransky and colleagues retrospectively evaluated 618 babies presenting with breastfeeding symptoms. In this study, almost 20% had PTT alone and a further 5% had both PTT and a lip tie. As is the case with the O’Callahan study, the vast majority of babies in this study showed improvement in breastfeeding quality following frenotomy. A posterior tongue tie is the presence of abnormal collagen fibers in a submucosal location surrounded by abnormally tight mucous membranes under the front of the tongue. A classic anterior tongue tie always has a posterior component behind it. Therefore, any tongue tie causing breastfeeding problems is truly a posterior tongue tie; a percentage of those ties also have an anterior component. Failure to release all of the abnormal collagen fibers results in persistent tongue restriction. When providers claim to release 80-90% of the restriction, the dyad can often see 0% improvement. The other major misconception that people have about PTT anatomy is the idea that the tie is somehow “deep” and that it intertwines with the muscles of the tongue. This is not the case. As seen in the diagrams here, the abnormal collagen fibers of the PTT are intertwined within the mucous membrane covering the tongue muscles. The muscle of the tongue beneath this mucous membrane (the genioglossus muscle) is in a completely different tissue layer and is therefore not involved in tongue tie anatomy nor does it need to be involved in the release procedure.